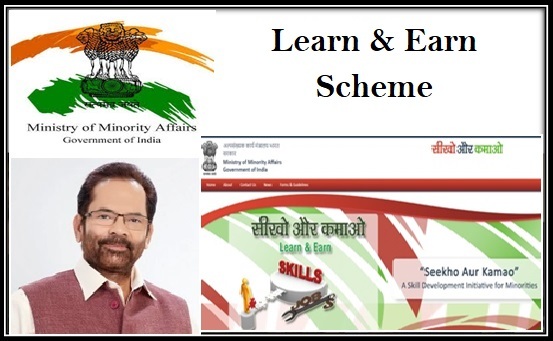 The Ministry of Minority Affairs has implemented one special skill development scheme which is dedicated to the youths of the country who belong to the minority groups. This project named the Seekho Aur Kamao scheme was launched by the previous UPA Govt. during its regime in the financial year 2013 – 2014. As this scheme offers skill development opportunities to the minority group youths, they may get several vocational trainings under this scheme and look for employment opportunities through it. The Govt. will provide the minority youths specialized trainings based on their qualification or talents and the same may be channeled to proceed for self – employment and earn living. This scheme will also empower the minority communities to join the mainstream and get hold of opportunities for development. As per records of employment rate of youths in the country, the youths who belonged to minority communities such as Christians, Buddhists, Sikhs, Parsis, Muslim, etc. are far behind than other youths. To empower them and to provide them with job opportunities so that they can also join the mainstream market and grab employment opportunities. This scheme is also pitched to preserve the unique traditional and cultural skills of those minority youths and nurture them for building up their future. Empowering the minority groups in the country will result in a strong and potential human resource for the country and will add up in nation’s development. The Arts and Crafts of India will also be preserved through this scheme as it will provide the minority youths vocational training on several fields. As this scheme is entirely for those who belong to the minority communities of the country, so the only beneficiaries of this Central Govt. skill development and employment opportunity scheme will be the members of the communities which are noted as Minorities as per the Minorities Commission Act of 1992. This includes five communities – Sikhs, Buddhists, Parsis, Christians and Muslims. Hence youths who belong to these noted minority communities may apply for this scheme and will get full support from the govt. for their job based training and employment opportunity. Minority communities which are also notified by some states or Union territories may also participate in this scheme but their total occupancy will be limited to 5 per cent of the total number of beneficiaries. “A Free coaching scheme has been started for the student who wants to complete their studies, but they don’t have enough monetary support . Similarly, Free Coaching Scheme For Civil Service Exam Telangana has also been launched for minorities. The beneficiaries of this Learn and Earn scheme should have a minimum education qualification of passing the Class 5 standard to get the vocational training. The minimum age of joining the scheme is 14 years where as the upper age allowed is been fixed to 35 years. In case these two criteria are not fulfilled, one will not be allowed to join the scheme and get benefits from it. In case seats are unoccupied, they will remain same as only prescribed eligibility criteria are mandatory to join this scheme. Depending on the marketing trends as well as the qualifications and extra-curricular activities, the training module for the beneficiaries will be decided. There will be Modular development programs which will provide the beneficiaries with training on various traditional skill sets which have a good demand in the market. The course structure will be decided by the NCVT which is the national organization for providing vocational courses. The vocational trainings will include courses on weaving, tannery, carpet making, wooden works, jewelry making, brass metal finishing, embroidery, Chikakkari, etc. Apart from these vocational courses, the scheme will also provide courses on Information Technology, computer operations, English, regional languages, etc. Employment support in both traditional trades as well as modern trades will be provided by the government. The govt. will also support those who want to explore the self – employment option and start entrepreneurship. Beneficiaries who will make outstation boarding in the training centres will be provided with fooding and lodging facilities along with a monthly stipend. Under this project, the Central Govt. is ensuring placement of at least 75 per cent of the trainees. Out of this, the Govt. promises to place at least 50 per cent trainees to the organized sectors. In the current financial year, the Central Govt. has made a budget allocation of Rs. 250 crore for this scheme. This is higher by Rs. 40 crore, compared to the previous year’s budget allocation. Eligible beneficiaries who wish to apply for the Learn and Earn scheme of the Central Govt. should approach with the office of BDO or the District Collector. One will also get the details and form fill up options from the Panchayat office. To download the form online, one may visit to the official website of the scheme – http://seekhoaurkamao-moma.gov.in. For any further help or enquiry, one may reach out to the Toll Free help line 1800112001.